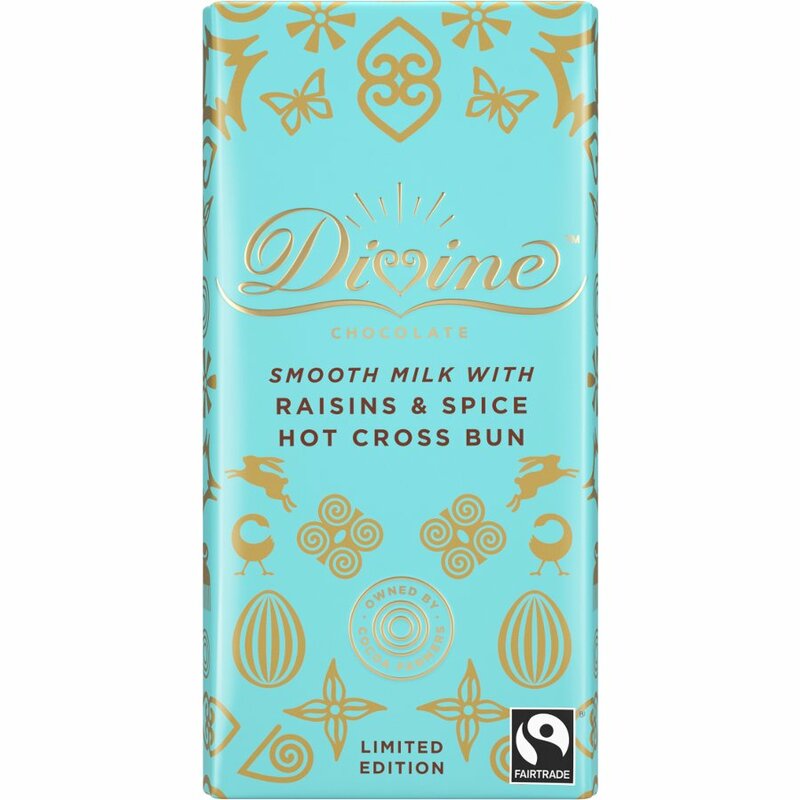 Deliciously unconventional, this hot cross bun chocolate bar from Divine Chocolate is a fantastic fair-trade taste-sensation. On top of mouth-watering luxury milk chocolate, this bar also comes with delectable spices for that perfect hot cross bun taste, plus a cluster of tasty raisins. Each bite is filled with that classic taste of freshly-baked hot cross buns from the bakers – free from artificial flavourings, soya and palm oil. This delicious taste wouldn’t be possible without the high-quality cocoa; picked and grown in Ghana under FairTrade certified conditions. Sugar, cocoa butter, dried cream (milk), raisins 10%, cocoa mass, spiced cookies 8% (wheat flour, sugar, spelt (wheat), sunflower oil, caramel sugar syrup, raising agent, acidifier: citric acid, spices), whole milk powder, sweet whey powder (milk), spices, emulsifier, sunflower lecithin, vanilla. Cocoa solids 31% minimum in chocolate, milk solids 17% minimum. For allergens, see ingredients in bold. May contain nuts. There are currently no questions to display about Divine Limited Edition Hot Cross Bun Chocolate Bar - 90g.